I wrote this back in February and shared with some people, I had hoped to get a photo of Nova but thus far it has not happened. How do I begin to tell you how rewarded I feel today? Is there a short form to this story? The answers is no, if am to relate to you the tale of a small dog with crooked front leg which I found chained to a centre pillar in a large room on the second floor in an illegal drug emporium in downtown Vancouver some 7 years ago. The neighbours said that she had been stepped on as a small puppy and untreated the broken leg had turned to the side. Abandon by her owners who fled out a window when the drug squad raided the establishment, the young female dog was without food or water for at least five days before the landlord contacted me to deal with a problem of rent arrears. I had a locksmith open the doors and when I entered on the second floor, I discovered the dog. It was mongrel approximately 30 lbs and 6 months of age, trembling and scared but extremely ferocious. The large open area was littered with feces and the overturned water bowl was completely dry. The 10 foot chain had several wraps around the post making it shorter each time the dog circled it until it was about 4 feet long. When the tenants phoned me the next day to complain about me ruining their business, I urged them to come for the dog but instead they chose to swear and threaten me. That day I went back to the premises and could see the water and the food had been devoured. The dog was a little less fierce but still really scared. I went a near by restaurant and spoke to the owner about buying some hamburger patties, and when she found out why I wanted them she made a large container of warm rice, gravy and fresh grilled hamburgers but she would not take any money for it. For the next 3 days I watered, fed and talked to the dog, which by now was somewhat calmed but still would not let me come near. I visited once during the weekend and Monday after several unsuccessful attempts to coax the owners to come to pick the dog up, I called the SPCA to come and take her away. While I waited the truck to pick her up I was able to unfasten the chain from the pillar. The dog was wary and stayed away from me by going into the adjoining rooms all of which opened into each other; however when the SPCA driver arrived much to my surprise the dog came near me and let me take the chain and touch her. She was quiet and calm and well behaved as I walked her down the long wide stairway and out to the awaiting pound truck. As the driver thanked me for the donation for the shelter he opened the back door and I said to the dog, “You will be safe now, get in.” She looked at me for a brief moment almost as if relived and then jumped into the van. In a moment the van drove away, as stood there I watched feeling sad for the small bond was broken. I told this tale to a few people and sometimes would wonder what her final fate had been. February 8, 2010 A happy ending! Today, my canine partner and best buddy Barklee lead me to a new park for “off lease” in south Vancouver. A beautiful spring like warm sunny day is a great day for a walk. We strolled around the wooded lands and the roadway led up a small hill and at the top of the hill I saw two women, a baby carriage and a pack of dogs passing along the upper road. One of the dogs stopped stood still and stared at Barklee and I as we climbed toward the upper road. I thought it unusual that one dog stopped did not move muscle or turn and follow the pack but it just stared down the trail with its tail curled up behind in a tight coil. When Barklee reached the top he continued past the dark still figure without either of them paying attention to the other. As I approached to within about 5 feet I spoke to the black dog, when I did it started to walk slowly toward me, it had a crocked front leg. First it pressed its head against my leg and then turned to lean against my legs as if to hug me and I recognized the front leg was pointing out and then I remembered that leg. I called out to the ladies up the road, “Is this your dog?” One said “Yes” and I asked if might speak to them about the dog. She said “It’s not really mine but I have been walking it for many years, ever since the owners got it from the pound”. I told them that I was responsible for it being in the pound and they were moved to tears as heard my story. We talked for about 15 minutes and all the time the dog, named Nova leaned on my legs and finally laid down on my feet. When the lady said “let’s go”, Nova did not move, the lady, Kim, said “Nova likes men but we’ve never seen her act like this!” During all this time Barklee who normally is very jealous of other dogs that come to me sat by quietly never showing anything but interest. We all walked back to the parking lot Nova between Kim and me. Kim promised to give the owners my business card and I hope to hear from them someday, but I have been completely rewarded. Nova has a good home, family and friends human and animal. I don’t know how karma works or how a dog remembers after seven years but it makes me very, very happy. There on a lonely highway west of Saskatoon, Saskatchewan on a sunny morning a young English man, a photographer student was sitting at the shoulder of the road trying an optical experiment to recreate the birth of fire when a big green Mercedes Benz stopped and backed up much to the surprise of the hitch hiker the driver powered the window down and asked if he was looking for a ride. From the look on his face I guessed he was not accustomed to western Canadian hospitality! from that desolated spot to the Calgary Stampede and on to Vancouver, grooved to Meat Loaf, Children Of Sanchez: Chuck Mangione and other current artists. Gary Hopkins spent some time assisting at Brighouse brake and Wheel in Richmond before returning to England to further his studies. Flash to the present!! Gary contacted me via the Internet and since he has forwarded this photo of him and his family. pictured are Gary, his beautiful spouse Elle and their two sons Nick and James. I hope someday that we will have the opportunity to visit here or in Britain or at Bonneville. Life has a way of presenting us all with the opportunity to build a bank of great memories. Brian has compiled a short video for us from the video taken at Bonneville by Tofini family and Tom Tom. He will add to it and eventually we will have something our fans can download or have on DVD. Brian also is good a sourcing anything from car parts to cocktail recipes. He is a good friend and a valuable asset to the GOLDENHAWK project. I am sharing this with you, but have not received an OK yet but I am confident he won't mind. Dear Randy, I am a director of the Nanton Lancaster Society Air Museum just south of Calgary. We are Canada's Bomber Command Memorial and have built up our museum to honour our veterans of the RCAF. Please see http://www.lancastermuseum.ca/ for all the details. We are building a special tribute display to a son of Nanton, Jack Allan, a World War 2 Hurricane pilot who flew in N. Africa and was a post war RCAF pilot. Jack's last command before retirement was as Commanding Officer of the Golden Hawks 1960-1962 ! 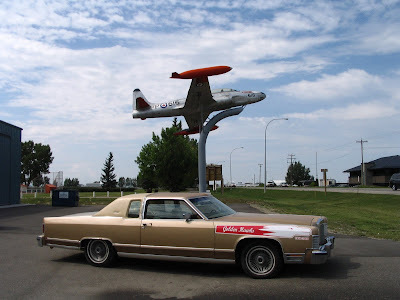 As I was a Young lad the Golden Hawks were my heroes and I got to sit in one of the Golden Hawks in Prince Albert when I was 12 in 1963. We have a T-33 on display at Nanton and decided to mark it in Golden Hawk markings because of the 50th anniversary of the Golden Hawks and because of the Jack Allan connection (Jack Allan flew a support T-33 as CO with Golden Hawk markings from airshow to airshow as the Hawks moved around the country). I just wanted to let you know I am very interested in your Goldenhawk Streamliner and speed team efforts for all the above reasons. Plus you guys are Canadian and I would like to support your team in some way so that you can show our geographically challenged cousins down south (bless their hearts) that the need for speed lives here too. Please let me know what is your time schedule for going back to Bonneville. Also interested in coming out to see your Streamliner. I will mention your efforts to Mike Potter in Ottawa who owns the Golden Hawk Sabre if you have not already done so. Bounce back to me with any ideas or info on your teams efforts. Gofers are the backbone of a Race team. Cody is planning to keep the tools organised by designing (along with Bryson) wooden boxes that will fasten to the trailer for transport and then stood up in the pits will serve as tool boards and wind breaks. I am hoping Yuri and Anne bring the young men with them this year again. Jason and Alex will be familiar with the pit arrangements and aware of the thrashing that can take place (hopefully not this year) as they if willing can assist Cody. The "Gofers" were very important part of our efforts last year, although they weren't sure if the title was complimentary. I assured them that it is not only respected part of any race team but that I had served as gofer for many racers over the years. The corrosion is mostly superficial but it is amazing that some parts are affected and some not. Parts of the same kind and close together have different condition? Boy you sure can find all the filings that were invisible at Bonneville as they show up quite red now. Special thanks goes out to Paolo Carraro and his family for providing us with the warehouse space to set up our meager operations. It is a very nice building, lots of light, space, power and clean washrooms. A big contrast to our tent in Werner's backyard, however, having everything next door was handy for us. Today we started starting Bonneville preparation. First take the Hawk outside to wash it again. Dean towed it with the little jeep and Cody pressure washed it again. Bryson was removing parts as we went out the door. I want to thank all those folks who took the day off to celebrate my birthday. Oh! It's also Easter, Good Friday, well that explains it. So much for the ego. Thanks to all the people who have sent and emailed and phoned good wishes to me many were very unexpected. HAPPY EASTER Everyone, may enjoy time with your friends and family.